The Decorated Style, also known as the Geometrical and Curvilinear, Middle Pointed, Edwardian, Later Plantagenet, or Fourteenth-Century Style, comprises the reigns of Edward II (1307-27, Edward III (1327-77). The general appearance, although there is an increasing rich- ness of ornamentation, is simple, from the small number of parts, and magnificent, from the size of the windows filled in with geometrical and flowing tracery; Clerestories were enlarged at the expense of the triforium. Vaulting ribs were more numerous and complex than in the previous style, the vault becoming a main feature in the effect of the interiors. Left: Spire with Parapet Angle Turrets & Crockets, Salisbury Cathedral. The new plans were set out with a wider spacing in the bays, more noticeable in parish churches than in cathedrals already started in earlier periods. The progress of vaulting regulated the planning of the piers, and was in itself strongly influenced by the increased size of the openings required to exhibit stained glass. In domestic architecture the "Hall" was highly developed, as at Westminster and Penshurst. Several of the great central towers were now carried up, as Salisbury, Lincoln, and Lichfield. Spires, usually octagonal, are lofty, and the "broach" form, characteristic of the thirteenth century, gradually gave way to parapets with angle pinnacles. Spire-lights are ornamented with crockets, and ribs occur on the angles of the tapering spires. The increased size of the traceried windows, and the importance of the buttresses are characteristic of the style, and the extension of tracery to the walls in the shape of panelling was now introduced. Buttresses occur with offsets in stages, and in later periods are ornamented with niches and crocketed canopies, as in the exterior of Lincoln. Angle buttresses, set diagonally, were introduced in this period. Parapets were often pierced with flowing tracery, but this was especially a French feature, the English generally keeping to the battlemented form. The proportions of height to width are less lofty than in the Early English period. Windows are large, and divided by mullions into two or more lights. Tracery at first consisted of geometric forms, as in the cloisters of Salisbury, the choir clerestories of Ely, Lincoln, and Lichfield, and the nave of York. In the latter part of the period it was flowing in character as in the choirs of Ely and Wells. The cusps, which in the Early English style were often planted on, in this period were cut out of the stone forming the tracery. Doorways are ornamented with engaged shafts, and have jambs of less depth than in the Early English style. Arches were formed by being struck from the points of equilateral triangles, or even of lower proportion (No. 299 i). The ogee arch (No. 299 v) was also used. The enlargement of clerestory windows proceeded pari passu with the diminution in height of the triforium (No. 137 F). These are of moderate pitch, and sometimes have open framing, of which Eitham Palace and S. Etheldreda, Ely Place, Holborn, are good examples. Piers are sometimes diamond-shaped on plan, with engaged shafts. Small shafts, surrounding and attached to a central column, were a development from the Early English. The capitals, when moulded, are similar to those in the Early English style, but not so deeply undercut. When carved, the foliage is more naturalistic, and resembles the leaves of the oak, ivy, maple, or vine. Hollow mouldings are ornamented with the ball-flower, which is specially characteristic of the style, other mouldings being shown on Nos. 143 and 146. Cornices and dripstones often have their deep hollows filled with foliage and carving, and are ornamented with crockets. Dripstones are finished with carved heads or grotesques, as at Cley Church, Norfolk (No. 143). Base mouldings to walls are strongly marked, as seen in the exterior of Lincoln (No. 125). Carved foliage in this period is generally naturalistic, and consists of seaweed, ivy, oak, and vine leaves, and the well-known tablet flower (Nos. 147 and 148). 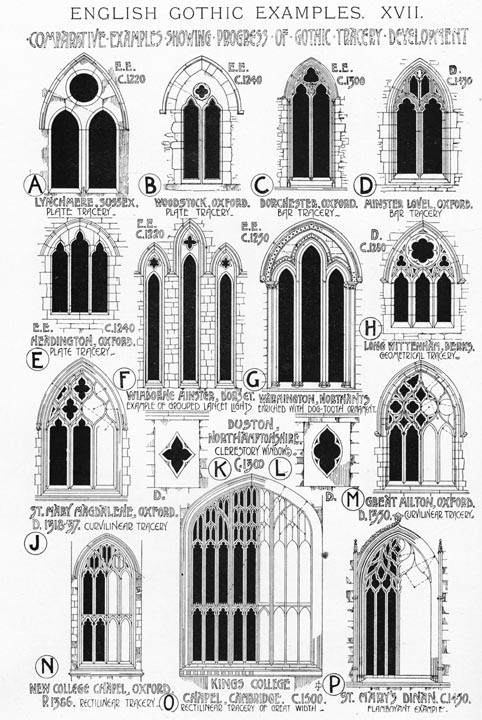 Stained glass led to a great extension of window openings, and the development of tracery. In itself it lost the mosaic character and became more translucent, the pieces being larger, and lighter in tone. The subjects portrayed became of more importance, and there was a loss in the general decorative effect of the interior, but the glass in itself gained in value and expression. Fittings, more especially in wood, as screens, choir stalls, pews, and pulpits, began to acquire character and importance. Shrines and tombs in masonry are elaborate and beautiful adjuncts to the interiors of the cathedrals and large churches, and the crockets and finials to pinnacles and canopies increased in importance and gave additional richness to buildings of this period (Nos. 143 D, 147 K). Examples of a decorated font, piscina, tabernacle and sedilia, are shown on No. 144, a brass eagle lectern on No. 145, and a gable cross, finial and boss on No. 149. Fletcher, Banister, and Banister F. Fletcher. A History of Architecture on the Comparative Method for the Student, Craftsman, and Amateur. 5th ed. London: B. T. Batsford, 1905. Pp. 341-49.